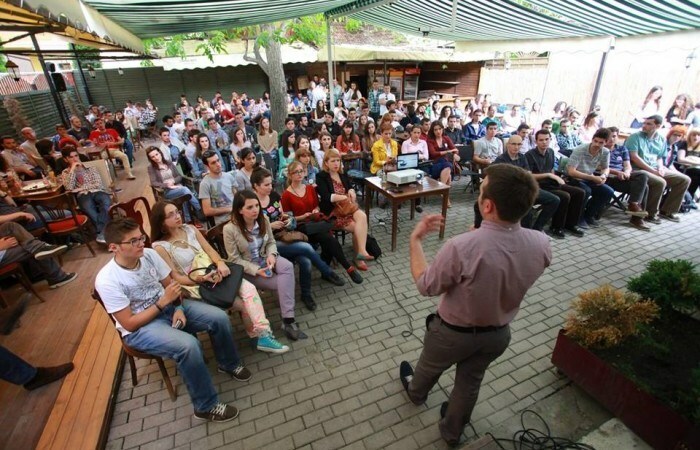 The thirteenth edition of BarCamp Prishtina gathered more than 170 participants in a new and outdoor venue, which looked like the perfect place for the sunny BarCamp days. In a friendly atmosphere people got the chance to mingle with each other and set themselves ready to listen the speakers of different backgrounds and from different projects. Right in the beginning, in a typical BarCamp atmosphere, Jese Bania, an intern at Unicef Innovations Lab, talked about his new adventure in Kosovo and his idea of working with people in pre-incubation stage of their projects. Dijon Vula, Dren Imeraj, Agon Avdimetaj, Dorjan Berisha, Narona Ahmeti, Furtuna Sheremeti, and Lotspot team were the guest speakers for this edition. Founders of Smart Home Pocket, now called Smarq Squared LLC, talked about how their life changed from two dedicated students they became two company founders who are trying to solve a global problem. “It started with an idea which was generated through a home problem” said Dren, explaining how Smart Squared started at Startup Weekend and how it achieved to convince the jury that they are the best team to win. “Within 54 hours we achieved to build a rough prototype and turn off a TV, while we didn’t manage to close the door since it was a bit too far for us” laughed Dijon, while he was giving more details into the product development phase now at Innovation Centre Kosovo, where they are also developing the mobile app to support the hardware. While presenting without slides, the Math 4 Kids team achieved to generate a fantastic atmosphere making people laugh and feel nice around them. They explained how everything began during Startup Weekend, how they developed Math 4 Kids and how they applied for AppCamp with the idea of Skendermen and another tourism app. Agon and Dorjan were quite thankful for the support offered by Innovation Centre Kosovo so far on developing their business. They gave a short information about Appsix, app development company that has been found by them and which is doing a bunch of work for different clients, including Smart Squared. Wiki Academy participants shared their work experience before, during and after WikiAcademy. “IPKO Foundation has done a fantastic job in organizing something like WikiAcademy, engaging the community around writing content for their own country. I got the chance to write about the legal systems in Kosovo, which served also for foreign students to see that there is something like that in Kosovo too” said Furtuna. Narona talked about the work done in the article of Monuments in Kosovo, explaining how people from Serbia are quite active in Wikipedia and have done a lot of editing in the article, and are very keen on responding immediately, just to make it somehow related to Serbia. Team Lotspot, from Social Innovations Camp, were the last one to present, while their presentation was more like a business pitch compared to the pitches from the others. People were curious to know more about how their app does solve the problem of the lack of public parking space. “It is an app that gives you the chance to tag a free parking spot, so that the other one who has the same app can see where it is” said one of the founders.